Something that I have always admired and appreciated is the tenacity of children. Through my work with Need To Read Book Club, I have personally seen thousands of books distributed to children in need. I started this project in 2004 in order to provide an outlet for young people (including myself) to make an impact in the community. Education was such an important emphasis in my home that I saw that the best way to make an impact was through books. Need To Read Book Club has continued, and just a few weeks ago, I had the wonderful opportunity to attend a Need To Read Book distribution at the Spartanburg Soup Kitchen. A group of sixth grade students distributed over 500 books to the children who frequented this organization. Just like at every single book distribution I attend, I was amazed by the children who receive these books – their positive demeanor, their enthusiasm for reading, and their excitement for the future. 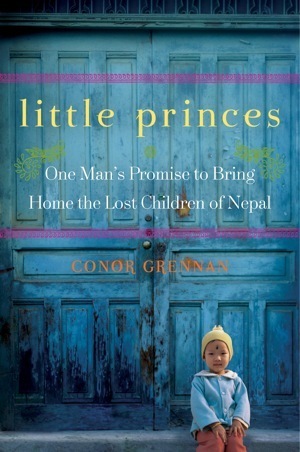 This is one of the reasons why I chose Little Princes:One Man’s Promise to Bring Home the Lost Children of Nepal by Conor Grennan. (Another reason I chose this book is that I desperately needed a feel-good book at the start of the spring 2012 semester – as I looked upon the next few months with a mountain of work and no end in sight.) 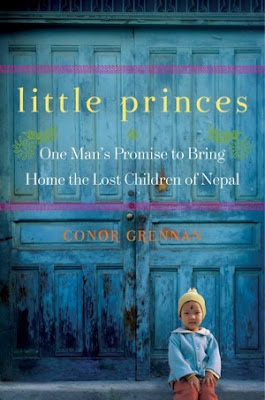 This book is a memoir of a young American man, who discovered his mission to help children in Nepal. Some of you might know about Nepal. I first came to know this country when watching a travel program about the Himalayas. Nepal is a landlocked country within the vast Himalaya mountain range – for this reason, the terrain is very difficult to navigate and has left much of the country in a state of poverty throughout its recent Civil War. It borders India and the Tibetan region of China. While reading this book, I developed a newly-found interest in the Civil War between the Nepalese monarchy and the Maoists (guerrilla groups which often controlled areas of the country.) The entire book is placed during the Civil War and the ceasefire in 2003. In fact, the conflict of the book stems as a result of the Civil War. During the time spent as a volunteer in an orphanage in Nepal, the author came to the realization that many of the orphans for which he was caring were not orphans at all. Instead, they were victims of a terrible scam. Throughout the Civil War, children were often taken as conscripts for the Maoist army in Nepal. This was especially true in the rural areas, where Maoists had more control. In order to provide opportunities for their children, parents would often spend all of their savings to smuggle their children out of the countryside to the city, where they would have a better future. Except they were not often provided a better future. Only the most fortunate found it into orphanages, such as the one for which the author worked. In response to this, the author made it his mission to make a difference, starting the organization, Next Generation Nepal. This is a wonderful book that will make you appreciate the tenacity and enthusiasm of children, the bonds of family, and the potential of humankind. I look forward to seeing what Next Generation Nepal will do next, and am looking to learn more about the country of Nepal.